The Kerala backwaters is the rather unappealing name given to the peaceful and picturesque palm-lined network of lagoons, lakes, rivers, and canals that run inland from the coast of Kerala, from Kochi (Cochin) to Kollam (Quilon). The main entry point, situated between Kochi and Kollam, is Alleppey. At the heart of the backwaters is vast Vembanad Lake. Traditionally, the backwaters are used by local people for transport, fishing, and agriculture. Annual snake boat races, held along the backwaters, also provide a great source of entertainment for the locals and tourists alike. 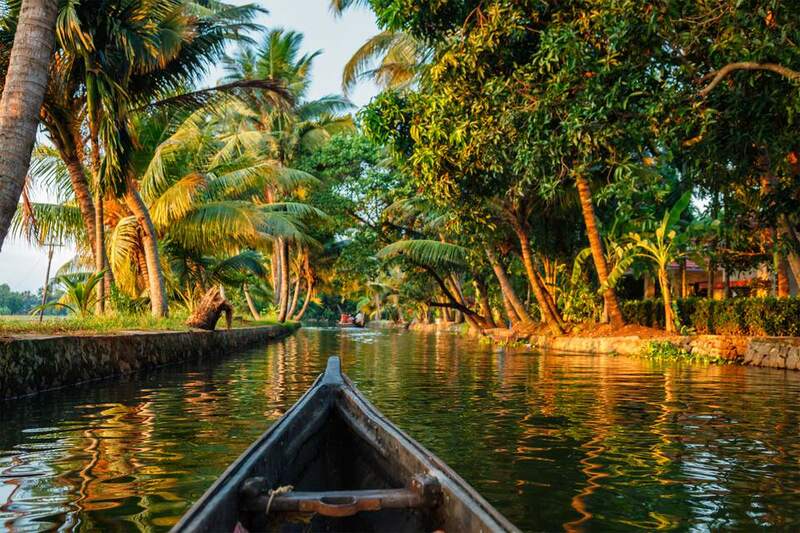 The lush green landscape, diverse wildlife, and houses and villages that line the backwaters make a journey along these waterways seem like a journey through another world. No wonder the backwaters is one of the must-visit tourist places in Kerala. Don't miss it! Alleppey can easily be reached in just over 2 hours by prepaid taxi from Kochi airport. Tickets are available at the booth in the airport arrivals hall. A much cheaper option is to take one of the Kerala State Road Transport Corporation bus services from the airport to Alleppey. Special fast bus services depart from the transit area between the terminals at 9.15 a.m., 9.30 a.m., 10.40 a.m., 4.10 p.m, and 4.20 p.m. However, the schedule isn't always followed. If you arrive at a time when there's not a bus, you'll find more services departing from Aluva Rajiv Gandhi Bus Station, about 20 minutes away, and the modern Vytilla Mobility Hub located 45 minutes away in Ernakulam. Alternatively, Indian Railways trains stop in Alleppey. The railway station closest to Kochi airport is Aluva (spelled Alwaye with code AWY), opposite the bus station. Another option is Ernakulam South, about an hour away. Most people who visit the Kerala backwaters hire a traditional Kerala-style houseboat (called a kettuvallam). It's a quintessential Kerala experience and one of the most tranquil and relaxing things you can do in India. Freshly cooked Indian food and chilled beer make the experience even more enjoyable. You can either go on a day trip or stay overnight on the boat. A trip on a houseboat can also be combined with staying at a resort, hotel, or homestay along the backwaters. The resorts and luxury hotels commonly have their own houseboats, and offer overnight and sunset cruises. Alternatively, other hotels can easily arrange a houseboat for you. Most of the accommodations are clustered along the banks of Vembanad Lake near Kumarakom in the Kottayam district, and near Alleppey. If you're traveling on a budget, it's possible to go on one of the many half or full day backwater tourist cruises that are on offer. Alternatively, if you want to check out the backwaters very cheaply, you can take one of the public boat services operated by the State Water Transport Department, such as the one between Alleppey and Kottayam. Travel time is two and a half hours, with numerous daily departures. The boat service passes through several small canals and villages. Do be aware that there aren't any toilets on the boat. The cheapest option for cruising the backwaters is on the Alleppey District Tourism Promotion Council (DTPC) tour between Alleppey and a rather unattractive Kollam. The journey takes eight hours and the boat (which is a large boat that's kind of like a ferry) departs daily at 10.30 a.m. from the DTPC boat jetty. There is a daily departure from Kollam at the same time. The cost is 300 rupees per person. Some people will be interested to know that these boats make a stop at the Matha Amrithanandamayi Mission of the Hugging Mother. The main drawback of going on this type of cruise is the length (it tends to get a bit boring after a while) and the fact that it only goes along the main waterways -- this means that you'll miss out on the village life that makes the backwaters so fascinating. Kerala Kayaking - The first company to offer guided kayaking tours along the backwaters. Cycling around villages is also possible. (Departs from Alleppey). Sreekrishna's Shikara Cruise - Motorized shikara boats are less expensive than a houseboat and able to access narrower canals. (Departs from Alleppey). Salmon Tours - Specializes in village backwater day tours in country boats, houseboats, and speedboats. (Departs from Kochi). Monroe Island Canoe Tours - Offers guided canoe trips to Monroe Island near Kollam. The narrow canals are really stunning. Monroe Island Backwaters Homestay provides inexpensive accommodations there. This tiny, little-known island rose to fame when National Geographic featured it as an outstanding sunset spot in 2016. Apparently, it used to be inhabited solely by crows but is now home to 300 or so families. The island is a short rowboat ride from the Kodumpuram ferry point near Eramalloor Junction on the mainland. Eco-friendly Kayal Island Retreat is the only place to stay there, with just four rustic waterfront cottages.